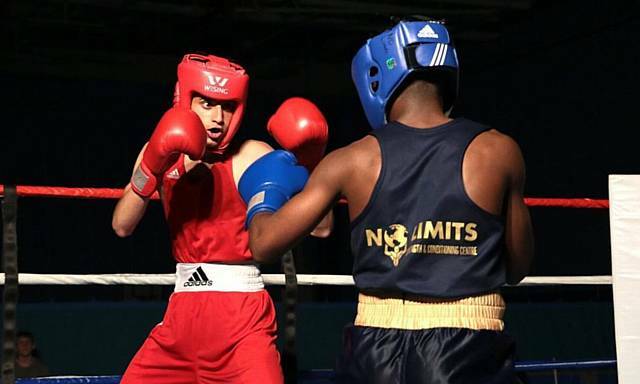 FIGHT fans of all ages were treated to a night of top class action as Oldham Boxing and Personal Development Centre staged its latest amateur boxing show at the state-of-the-art Oldham Leisure Centre. After the success of previous shows, the fighters had a lot to live up to, but they delivered some entertaining bouts in front of WBO world lightweight champion Terry Flanagan, British super-lightweight king Tyrone Nurse and the borough’s own up-and-coming podium potential star, Will Cawley. Before the action got under way the hundreds who attended stood to remember the greatest of all time, Muhammed Ali, and after that, the event surpassed all expectations, leaving the audience in awe at times. Zack Sellers (Sale) beat Jack Rowbottom (Tameside), points; Raza Iqbal (Oldham) lost to Eddie Peacock (Lee Jones), points; Alfie Gates (Sale) beat Peter Booth (Oliver’s Gym), unanimous decision; Kyle Tullin (Oldham) lost to Terry Pownall (Sale), points; Lewis Maylor (Oldham) lost to Aarron Davies (Tameside), split decision; Jayden Longdonghan (Oldham) beat Ben Gentry (Ancoats), TKO; Hussain Mahmood (Oldham) beat Lucas Dube (No Limits), points; John Idou (Sale) lost to Lewis Cummings (Moss Side), unanimous decision. Non-decision skills bout: Keiron Wardle (Tameside) v Mathew Tallon (Lee Jones). The unluckiest fighter of the night was Oldham’s Zammewr Ali, who was not allowed to enter the ring due to the event running over the the 11pm granted license time. However, the night proved a resounding success with both Twitter and Facebook alive with positive comments.